The rich treble choral repertoire of the Seattle Girls’ Choir is something special we wish to share with the world. For many years our Choir has performed in festivals and on concert tours to numerous countries. Our repertoire is truly a musical mosaic. Myriad colors, textures, texts, periods and styles are represented in this collection of gorgeous songs… songs taht are as enduring as they are inviting to singer and listener alike. We have selected some of our all-time favorites for this unique treasury from the choral art. Much of the music is sacred. Our Prime Voci (“First Voices”) Choir loves to perform in the soaring acoustics of European cathedrals and churches. It is meaningful and exciting for our young singers (ages 13 to 20 on this disc) to experience singing great choral literature in the type of acoustics for which the pieces were intended. There are also some wonderful secular pieces, including the hauntingly beautiful Vier Gesänge by Brahms, set for four-part women’s choir, two horns and harp. Randall Thompson’s Choose Something Like a Star, set to a poem by Robert Frost, is offered in memoriam to the late Karin Gause. Karin was a faculty member for twenty-one years. She developed and taught our music theory program, and her loss from cancer saddened us all. 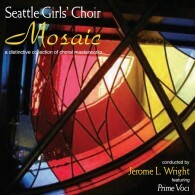 No Seattle Girls’ Choir mosaic would be complete without a piece by our own “Compoesr Laureate” Jackson Berkey. Jackson loves Seattle Girls’ Choir and our sound – to the extent that Prime Voci has recorded two compact discs devoted entirely to his treble music! As a result of these recordings, the Choir has received two Grammy nominations. Nunc Dimittis was originally commissioned for men’s choir by the Singing Statesmen of the University of Wisconsin – Eau Claire. Jackson Berkey provided Seattle Girls’ Choir with an exquisite setting for treble voices, just in time for our European Tour in 2006. Our mosaic is much more than colorful pieces of choral music. It comprises our young singers and their families, our faculty, the Seattle Girls’ Choir Guild and our entire choral community. For their support and devotion to this project, and to project chairpersons Catherine Davila, I say – from the heart – thank you!